(c) Library & Information Science. (c) School of Environmental Design and Technology (SEDT). N/B: Application on-line commences on 2nd July and closes on 20th July, 2018. 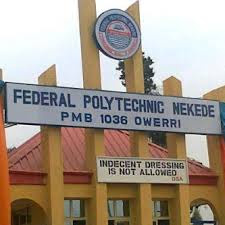 How to Apply for Nekede Poly HND Screening Test. 1. All candidates must first go to the school portal www.fpno.edu.ng and click on “Application link” on the home page under students (HND). 2. Submit your application number on the box provided and generate an invoice, print or copy out the invoice. (you can do this on your mobile phone). 3. Proceed to any bank of your choice and make payment of Two Thousand Naira (₦2,000.00) on REMITA Platform Account No. 0140468461017, using your invoice number. You can also choose to make your payment using your verve, visa, or Master Card. If you choose the card payment option, you will be asked to fill the card details for the payment to be processed immediately. 4. Return to school portal www.fpno.edu.ng and complete your application process. Submit your data as requested and print out your card and acknowledgement slip. You will return to the portal immediately to print your receipt and acknowledgement slip. 5. All application procedures must be concluded on or before midnight of 20th July, 2018.